You might say Clarence Henry carried on the tradition of great New Orleans rhythm and blues singers like Fats Domino, Lloyd Price and Smiley Lewis...with a twist. 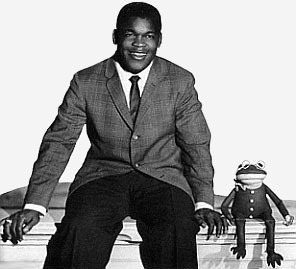 It was established in his first hit that he could '...sing like a girl' and, more significantly, '...like a frog!,' this latter vocal impression becoming a trademark, one he (and his record label, the Chicago-based Chess Records) sometimes ignored completely but occasionally embraced (to the extent of working a puppet into the act in the form of a cute lil' croaker). Ultimately the "Frogman" moniker became a permanent part of Clarence's persona. The future Frogman was born into a large household (four girls, two boys, mom and musically-inclined dad) in 1937 in Algiers, a town on the edge of the Mississippi River where it curves its way through New Orleans, a smidge southeast of the wrought-iron neighborhood where all the fascinating hot spots were. They lived in the bigger city for awhile, but moved back across the river to Algiers when jobs got scarce. A passion for playing boogie-woogie piano burned in the young Henry's chest, though he liked the idea of playing multiple instruments like his pop and at the age of eight talked his mother into covering the cost of piano lessons, which meant walking and ferrying across the river and back to learn classical form and beloved standards...and bangin' out jump tunes the best he knew how when mom wasn't around. His nearby black-and-white-key heroes were the aforementioned Domino and Professor Longhair (also known as Roy Byrd, whose hit, "Bald Head," had rattled radio speakers about the time the youngster hit his teens); the wearisome several-miles-each-way hike for those lessons yielded an occasional bonus, giving him a chance to sneak into one of the French Quarter clubs to watch the Professor perform (an opportunity we all would have attempted had we been in his well-worn shoes). Clarence's main post-piano device was the trombone, which he blew in high school circa '53 or '54 as a member of The Toppers, a band that actually made records for Imperial (usually at Cosimo Matassa's studio on Rampart Street, not far from Domino's house in the Lower Ninth Ward). Slightly older schoolmate Bobby Mitchell sang lead for the band, but went the solo route soon afterwards and had a hit, "Try Rock and Roll," in 1956. Clarence claimed Bobby fired him when he didn't show up for a gig. The reason? He was busy attending a "shotgun wedding"...his own! He found work playing piano at local dives like Bill's Chicken Shack and the Joy Lounge, lining his pockets with about 50 bucks a week, enough to get him, the little lady and "oops"-baby by for the time being (later he married a second time, his children totaling ten). Clarence and Paul Gayten (a well-known bandleader affiliated with Leonard Chess and his Chess Records operation far north in Chicago) crossed paths at the Brass Rail on Canal Street. Henry impressed Gayten with an improvised "frog song" (he used to scare the girls in school doing the voice...did they think they'd get warts?). The lively girl-and-frog number became a small-scale sensation with bar patrons. Gayten triggered Henry's forward motion by tipping the eldest Chess brother, who showed up one night to see for himself. Recognizing the song's potential appeal to adults and kids alike, he encouraged Henry to record the song with Gayten and forward the master to him. "Ain't Got No Home" came to life at Cosimo's with the usual crack N.O. musicians and was released on the recently-established Chess sub-label Argo near the end of 1956. Someone got cold feet about the novelty tune and decided the other side, "Troubles, Troubles" (a kickin' little song in its own right) would be the disc's A side. 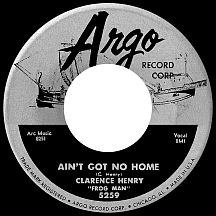 Clarence "Poppa Stoppa" Hayman (the third DJ to use the name originated by Vernon Winslow in the late '40s) preferred "Ain't Got No Home" (C.H. 's girl part, by the way, was patterned after Shirley Goodman's high-pitched sound in the hit singles he'd heard by Big Easy-based Aladdin Records duo Shirley and Lee). Poppa Stoppa's listeners responded with glee; he seized the opportunity to take credit for "discovering" New Orleans' newly-notorious "Frogman." 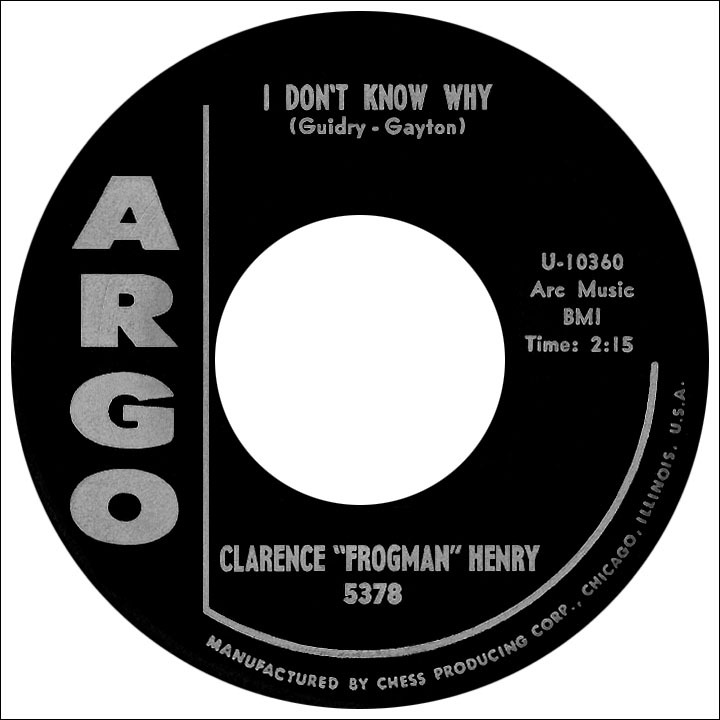 By mid-January '57, the single (credited to Clarence Henry "Frog Man") had reached number 20 among Billboard's best selling pop records and sat at number three on the R&B chart (so close to Fats Domino, his idol from north of the river, whose "Blueberry Hill" perched at the top). Despite making the grade at in top venues like Harlem's Apollo Theater, the Howard in D.C. and the Royal Theater in Baltimore, the more Fats-like midtempo follow-up "Lonely Tramp" (sans the "Frogman" tag on the label) was a chart no-show; the "answer" to the breakout hit, "I Found a Home" (frog and girl were back and happier than ever! ), likewise failed to excite. 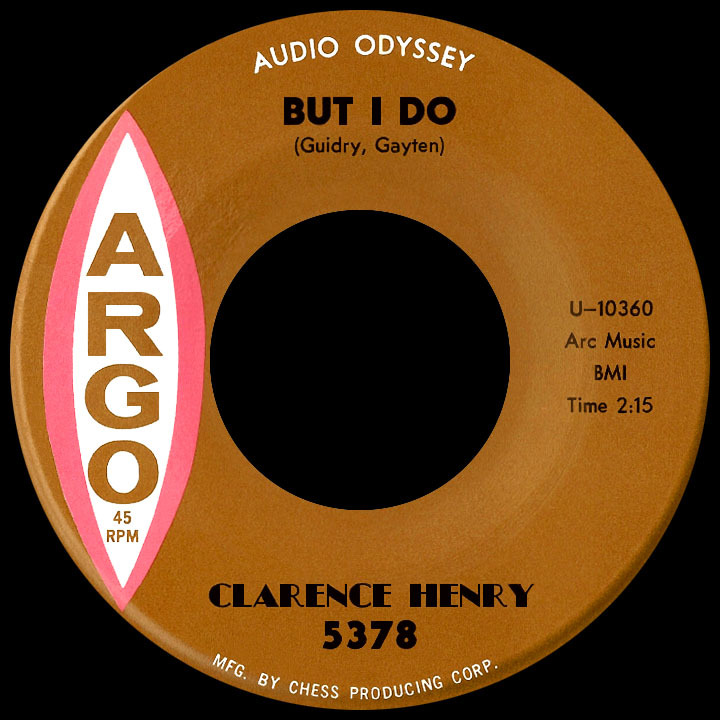 "I'm in Love," the first to designate him as Clarence "Frogman" Henry, suffered the same fate and Argo singles stopped appearing. Henry had put together a six-piece band and a lengthy, convenient stand in the French Quarter began at better Bourbon Street clubs like the Court of Two Sisters (a restaurant and bar with a colorful history spanning several decades). Around 1960, Leonard dropped by the club ready to commission more Frogman records...and the result was the hit of a lifetime. Again at Matassa's studio, producer Allen Toussaint created a striking stereo production (with sax man Nat Perilliat and a big horn section, but no frog) of "I Don't Know Why," written by Paul Gayten and Robert Guidry (a white singer-songwriter who'd recorded for Chess and Imperial as Bobby Charles). Not long after its release the title was changed to "But I Do," maybe to avoid confusion, or royalty complications, with "I Don't Know Why (I Just Do)," a song by Fred E. Ahlert and Roy Turk that had been a hit in 1931 for bandleader/saxophonists Wayne King and Benny Krueger and the incandescent Kate Smith (teen queen Linda Scott also had a hit with the song in the fall of '61). Henry's singularly-delivered original hit was issued on an assortment of Argo labels: some black, some beige, some with the "Frogman" nickname, some without...a dozen variations, maybe more! Its winter-to-spring run on the charts landed it in the top ten of both the pop and R&B charts. The next two singles were recorded in Chicago during an extensive road trip. Musicians (horn players especially) were carefully selected to duplicate the feel of "But I Do." "You Always Hurt The One You Love," a rather outdated tune penned by Doris Fisher and Allan Roberts, had been a number one hit for The Mills Brothers in 1944; the Frogman interpretation reached number 12 in June '61. "Lonely Street," a song by Joe Bisco (real name or pseudonym? ), went top 20 R&B and mid-chart at the pop level. While coast to coast gigs and television appearances were plentiful, Frogman had a session in Memphis that turned out minor late-'61/early '62 sellers "On Bended Knees" and "A Little Too Much." Later, Henry was back to doing sessions in New Orleans, with "Dream Myself a Sweetheart" and three other 45s taking him into 1964. Lennon, McCartney, Harrison, Henry and Starr: not a law firm! When The Beatles made their first "official" U.S. tour in August and September of 1964, Clarence's manager, Bob Astor, pulled a few strings and got him on the bill for 18 dates; Frogman (the nickname now permanently affixed) called it the "highlight" of his career. They even made a stop in New Orleans at City Park Stadium on Wednesday, September 16. While Britain's Fab Four stayed in a hotel, Henry made a short trip to Algiers, enjoyed a home-cooked meal and slept in his own bed before resuming the whirlwind schedule the next morning. That fall, after his Chess contract ended, he signed with "Crazy Cajun" Huey P. Meaux, who licensed his output to Parrot, a London Records subsidiary. The first of five singles, another chestnut from the 1930s, clutched the bottom rungs of the national song survey: "Have You Ever Been Lonely" ('...have you ever been blue?'). Its B side revived his amphibian pet, but "Little Green Frog" lacked the humorous spark of his breakthough hit from '57. Four sides recorded in Nashville with Buddy Killen materialized on Dial in '67 and '68. A 1970 Roulette LP, Clarence Frogman Henry is alive and well living in New Orleans and still doin' his thing... and a 1983 album recorded in Manchester, England, The Legendary Clarence 'Frogman' Henry, capped his studio career. More than just a nickname: over the years, Clarence amassed a collection of frogs (ceramic, plastic, puppets, plush toys, you name it) that just kept growing, hopefully not to the extent of pushing him out of his house. He settled in his home town and performed at the Bourbon Street nightclubs (La Strada, the 544 Club) for three or four more decades before considering semi-retirement. A new kind of radio airplay presented itself in the 1980s when talk show host Rush Limbaugh chose "Ain't Got No Home" as the opening for a daily feature on the homeless; at one point in the '90s, the two got together for an onstage duet. What a life it's been for the famous, longstanding resident of Algiers, Louisiana: our everlovin' "Frogman," Clarence Henry.